SO… why do they fly so low to ocean-wave and floor? I came across an interesting pattern and the words for it, but had to wait for the bird to cooperate, and just before it left my viewers frame… it pitched and rolled as if it new what I was up to. In 1946 Mr. Miles V. Sullivan patented the “Drinking Bird” whose origins are from a 1910s China toy called the “Insatiable Birdie” … A toy that appears to be of perpetual motion but in reality is an example of thermodynamics and a working theory of the heat engine. This on the other hand is one of Nature’s fishermen. “No one had more fun than I”… Not sure how to take that one.. At first I wanted to do research on Mr. Jones, the inscription, and his memorial; find out what those words meant to him, but as quick as that thought rose, I dismissed it.. I don’t want to know what those words meant to him.. Anyways, it’s not the saying that lured me to this memorial. It was because it was a rock. A boulder. 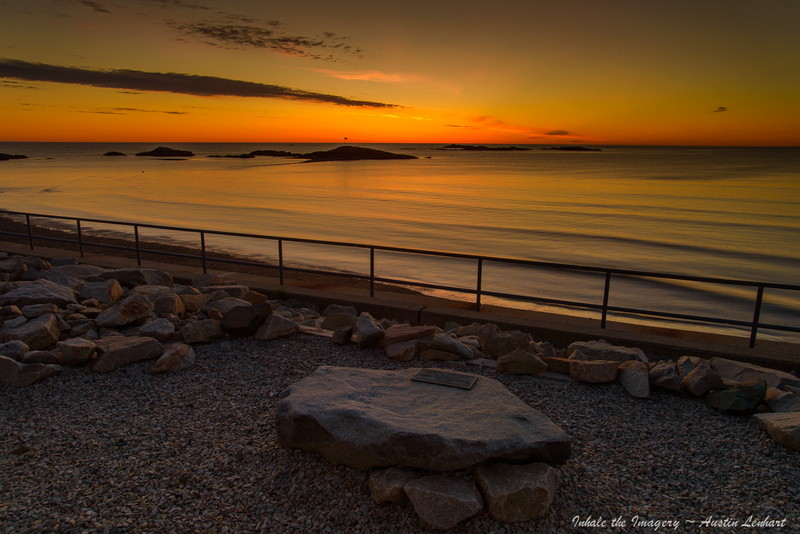 There are a few memorials along neighborhood street and Minot beach seawall… all benches except this one… A boulder and a clearing….. and for some reason, unknown to me, It’s footing stirred the feelings of why I started the Sunrise Project.. But why the stirring? … maybe it’s because I like sitting on rocks more than benches or that it’s more connected to the surrounding….I don’t know.. but I know its simple….Maybe that’s how his life was. It wasn’t about the toys but the experience, not about who he knew but how he spent time with family and friends. But then his saying throws me off..It can’t always be fun, I mean he was old enough to have served in WWII…we all have to have those moments; those minutes, days, months or maybe years of feelings that I would not categorize as fun.. maybe it’s better put “No one was more accepting than I”… That would make for a good life… Maybe that’s it..
What ever the reason….I brought my own to the rock and for that I thank you Mr. Jones.